Bobcat: multi-core AMD power in your next smartphone? AMD is preparing to revolutionise handheld devices with an all-new ultra high efficiency multi-core CPU design. Codenamed Bobcat and pencilled in for a 2009 launch, the new chip will boast a unique execution core architecture and major on performance per Watt. 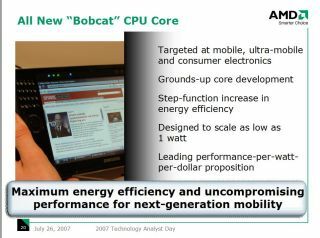 AMD says several versions of Bobcat will be released with maximum power consumption ranging from one to ten Watts. AMD hopes Bobcat will be a hit with makers of several mobile and small form factor devices including smartphones, ultra compact PCs and set-top boxes. However, it's likely the chip will face some stiff competition. Intel 's low-power Silverthorne CPU will be competing in the same space. Architecturally, Bobcat is best described as a simplified x86 execution core. AMD has yet to reveal full details, but claims the chip is a ground up new design. However, we suspect Bobcat's execution cores will resemble one of AMD's CPU designs from yesteryear with some added accoutrements such as increased floating point performance and SSE support. In that sense, it could be pretty similar to Intel's Silverthorne, which is based on the old Pentium M mobile CPU. The other crucial aspect of Bobcat's design is support for AMD's M-SPACE modular CPU construction. Consequently, AMD will be able to offer several different Bobcat models with varying computing power. M-SPACE allows AMD to add execution cores as well as other functional units including video decode engines according to the needs of a given device. Bobcat is part of a wider push from both AMD and Intel to conquer a wide range of consumer electronics devices with traditional x86-compatible PC processing technology. In the long run, Bobcat could deliver performance and functionality comparable to today's dual-core desktop PCs in a handheld device. Exciting stuff.